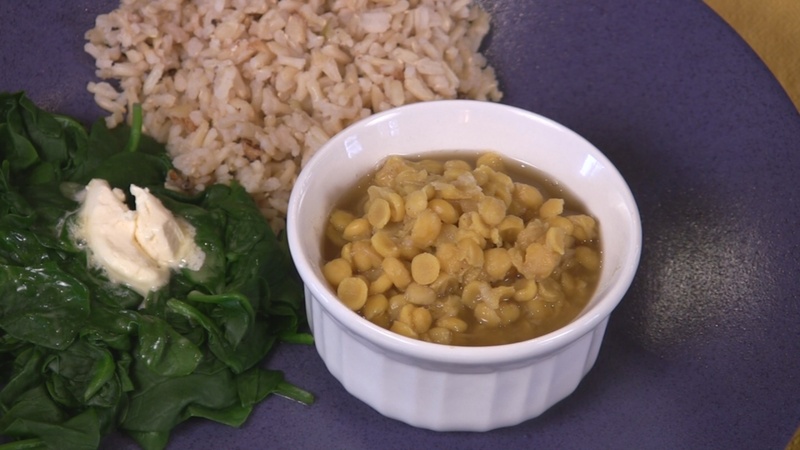 Chana dal is a small relative of the garbanzo bean. It is one of the lowest foods available on the glycemic index and is full of protein and fiber. Place the chana dal in a colander and rinse. Remove any stones, discolored beans or husks. Place in a pressure cooker and pour in enough water to cover by 1/2 -3/4 inches. Cover, lock the lid, place on the stove top and begin heating the pot. When it reaches pressure, lower the temperature to medium-low and begin timing. Cook for 8-15 minutes. This will depend on your altitude, type of water you have, and how soft you want the chana dal to be. See How To Use a Pressure Cooker for more information. When its finished cooking, release the pressure and take the pot to the sink. Run cool water on the lid until the pressure is completely released. Remove the lid. Add the spices, tamari, and using a garlic press, squeeze the garlic into the pot. Bring to a boil, lower the temperature and simmer for 3-5 minutes, or until the garlic is aromatic. Serve with brown rice or naan and steamed vegetables. If you don't have a pressure cooker you can also cook chana dal on the stove top or in the slow cooker. See Bean Cooking Chart for more information. Store chana dal in an air-tight container in the refrigerator for up to a week or freeze for several months. Other spices could also be added such as: turmeric, mustard seed, cumin, coriander seed, red pepper flakes,tamarind, ginger, fresh chilies, cardamom, cinnamon.